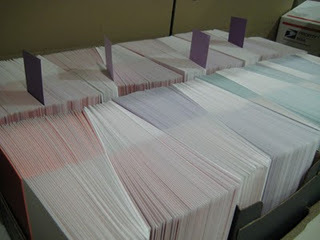 What does 800 cards from Crafterall look like? Welcome to dee islands, mon! Read more about Welcome to dee islands, mon! uffta (OOF-tah): interjection: Exclamation of Norwegian origin, popular in strongly Scandinavian settlements in the upper Midwest, used to express surprise, bewilderment, astonishment, pity, pain, and fatigue. Syn. yikes, oh boy, whoa nelly, hoo-wee, good gravy. Done! For a short while anyway. Read more about Done! For a short while anyway. Tomorrow -- YIKES! TOMORROW ALREADY! 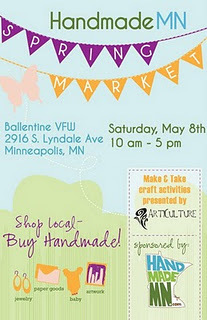 -- is the first annual HandmadeMN Team Spring Market! Read more about Next up, Marvelous Minnesotans! The St. Paul Craftstravaganza was a blast! It was my best show so far and everything went very well. There was a steady stream of shoppers all day, and for every sale I had, I received about 4 or 5 "Wow"s or "Beautiful"s or something sweet along those lines -- how cool! When you say, "Craftstravaganza," you've said it all! Last year, I took in my first St. Paul Craftstravaganza as a shopper, in awe of the awesomeness at every single booth (yes! None disappointed! ), and taking mental notes for what I might do were I to tackle my own craft fair booth someday. Read more about When you say, "Craftstravaganza," you've said it all! Thanks to my local Twitter contacts and some artsy friends, I heard about "Foot in the Door 4" with enough time to create and submit a piece for the event. The exhibit is produced and managed by the Minnesota Artists Exhibition Program as a subset of the Minneapolis Institute of Art. You can read all about it on their Web site, but basically the once-a-decade exhibit displays any and all submissions so long as each one fits within one square foot. It took me a while to get the play on words. Topography Card Sets @ MoMA Store Online! If you live outside New York and want your own set of the custom-colored, 4-card set of these topography cards, you're in luck! They are now available online at the MoMA Store site. 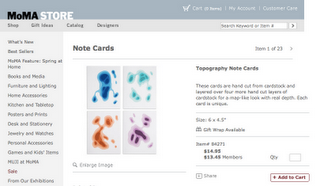 Read more about Topography Card Sets @ MoMA Store Online!